The Handmade Market!!! NEXT WEEK!! WHOOAAAA… Where did the month go???? November is already only 1.5 days away!? Please come to see me and some other absolutely amazing artists on November 8, from 11-5. Here are all the details on a Facebook event. Share this out to your friends and coworkers, too! Shop The Handmade Market in Raleigh, NC for hip, handcrafted goods from more than 50 of the best and brightest independent artists, designers, and crafters from North Carolina and beyond. This one day, indoor designer craft market features fine art, apparel, jewelry, accessories, housewares, paper goods, and more. Find unique, handmade gifts or treat yourself to something special. You’re sure to find what you’re looking for (and more!) at The Handmade Market. General admission to The Handmade Market (11am-5pm) is free, but every show we choose a local charity to support by way of a raffle at the entrance. Shoppers can buy raffle tickets in lieu of entry fee, and 100% of the raffle ticket sales goes to the chosen charity. The raffle prizes are always comprised of great products from local designers and businesses. 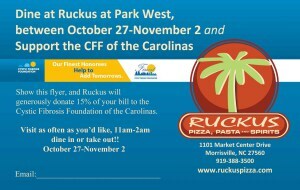 Eat at Ruckus Pizza & help the Cystic Fibrosis Foundation!! Reminder! 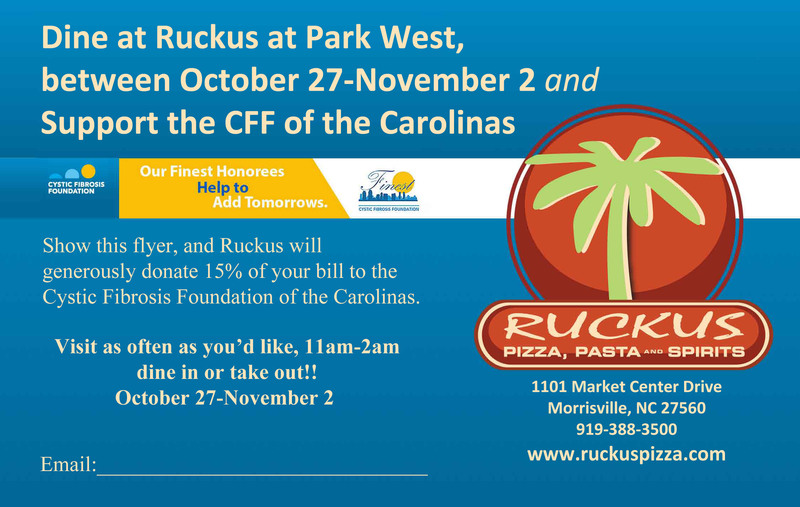 Dine in/Take out at Ruckus Pizza this week, mention CF, & 15% of all purchases go to CFF! Dine in or take out from Ruckus Pizza Pasta & Spirits – Morrisville from THIS Monday, Oct 27 through Sunday, Nov 2!! Mention you’re there in support of CFF or show this flyer, and they’ll donate 15% of your purchase to the Cystic Fibrosis Foundation!! I was nominated by a good friend as an Honoree for this year’s Top of the Triangle program. I’ve accepted this nomination, and in that, have committed to raising at least $2500 for the CF Foundation. I’m pleased to say that 90% of their funds go directly to research, education, and support for patients! I actually didn’t know much about CF prior to early-September. My friend who nominated me has CF in her extended family, which was motivation enough for me. Then I met this cutie pie, Maddie, and the rest of the Paige family. Maddie is 4 1/2, and has CF. When I met her, I think we kind of “clicked”… I gave her paper so she could draw. She also showed me how she can write her and her big brother’s (Macklin) name. Now I want to raise the funds on behalf of Maddie. You can go to my Triangle’s Finest page and make an online donation, be a sponsor, and/or buy tickets for the Finale event. More detailed information on sponsorship can be found HERE. The Finale event is at the American Institute of Architects, on November 20th. Please share these with your family and friends. Donations can be from anyone, anywhere! And,YES, most of the auction items can be shipped, and for very little. I am thrilled an honored to be designing two looks — one Couture, and one Ready-to-Wear — for Couture for a Cause this year. Each designer has a nonprofit they get inspiration from, and then create two looks to represent that nonprofit. The pieces are auctioned off to the highest bidder, and go home with that person right away! The money raised goes to Activate Good, who serves the community by gathering volunteers to work with various nonprofit organizations in the Triangle area. This year, I will be highlighting Triangle Family Services. They have been around for 77 years; originally established after wartime to help soldiers get home to their families. Currently, TFS serves people of the Triangle area find financial security, emergency housing, counseling of all sorts, and safety for themselves or their family. Please read up on their website. I visited their office today, and have an immense amount of respect for them. I am THRILLED that the amazing, exuberant Diana Cameron McQueen will be modeling these looks for me!!! You can support this event by purchasing tickets for the live auction, and also participating in the silent auction! Our designs will be judged by three people on a panel that night. ALSO, there’s an audience/people’s choice award; so I’d love it if you attended and voted for me!! The prize is having an online portfolio designed and hosted for a year. I’d really love that!! 1: Intro to Batik class!! HURRY… this one is coming up SOON!! It’s finally back on the calendar!!! It is super fun!! Go to the link to register!!! This one is held at Ornamentea near downtown Raleigh, October 11, from 2:30-5:30. 2: Shibori with Indigo dye!! I know lots of people will have fun with this one… I’ll go over some basic Shibori (Japanese Tie-dye, basically) techniques, and I’ll prepare an Indigo dye vat for you to use. This one is held at beautiful Gather in downtown Cary, November 15, 10:30-1:30.